Farr Yacht Design, always known for our racing design shapes is less well known for our fast cruising designs. While we have created successful yachts for such prestigious yards as Baltic, Wally, Nauta, and others, we have done very few that will carry the Farr Yacht Design name and that have been developed using our totally integrated research and design approach…until now! In early 2003 an Italian client and his Project Manager approached us. Their directive, "create for us a fast yet elegant performance cruising and racing design of approximately 86' in length". What is evolving is our design 535. There have been many attempts by others at this size of yacht, but our client felt that most were lacking in elegance above the waterline. His directive was to create a vision that was not broken up by combings and overly aggressive deck saloon type styling that seems to dominate today's designs arena. Sleek, simple, and elegant were our marching orders. The staff at Farr Yacht Design has attacked this eagerly and what is developing promises to be a yacht of uncompromising beauty not only in front of the fleet but at the dock as well. Key features of the yacht will include a lifting keel with a minimum 2.9-meter depth, a five stateroom layout, and a signature Farr Yacht Design hull shape that guarantees performance. The attached preliminary rendering images are our attempt to capture your request for a simple, clean, and elegant fast cruising yacht. Our preliminary concept pulls heavily from modern race boat design in its sheer line, stem slope, and overhangs. The deck in profile is sleek and well blended with its parent hull shape. On deck, clean rounded shapes are blended to enclose two cockpit areas while maintaining common styling character throughout. At the front of the yacht we've started with a stem slope and knuckle shape derived in basic proportion from recent racing boat projects. We've combined that stem with a sleek and elegant sheer line capable of producing the target headroom dimensions. The sheer line and stem have been rounded with a generous radius continuing the hull-colouring scheme up around the deck edge for an integrated and aerodynamic look. At the aft end of the boat we've combined a generous overhang with a clean and simple sloped cylindrical transom. On deck we've started with moderate deck camber, which balances well with the basic curvature of the hull topsides. We've added to that camber a sleek and simple cabin geometry intended to house dodgers, halyard line tunnels, hydraulic headsail control systems, and other equipment in order to keep the surrounding deck area as clean as possible. The cabin's geometry is composed of aggressively sloped sides and generously rounded intersections, which produce a clean and modern looking surface. We've echoed those same themes in a character coaming, which encompasses the deck's two cockpit areas with a stylish and functional surround. Our intention is to continue the hulls basic colour scheme on deck into the cabin and character coaming surfaces although ultimately this choice will be dependent on your precise colour selections. The forward cockpit area has been sized for ample seating room and has been recessed into the local deck surface to provide a cushioned seating surface. The cushioned surface continues seamlessly into a centrally located sunbathing area that allows it to function as a natural extension of the family area. A low bridge-deck surface connects the two character coamings behind the central cockpit, provides space for companionway and ventilation hatches, and signals a separation between the lounging and working areas. In this iteration we eliminated the mainsheet traveller in favour of a central mainsheet dead end that keeps the deck very simple and clean. We've moved the primary winches aft into this area so that they can be tailed from either the outboard side-deck or cockpit forward of the wheels. The wheels themselves have been positioned well outboard to provide an uninterrupted view of the bow and headsail. The optional running backstays have been positioned forward and outboard of the helmsman for safety reasons. The lower running backstay blocks and line run have been moved below deck to preserve the clean look of the side-decks. The aft cockpit sides, resulting in a gentle taper, concluding at the running backstay winches, intersect the character coaming. 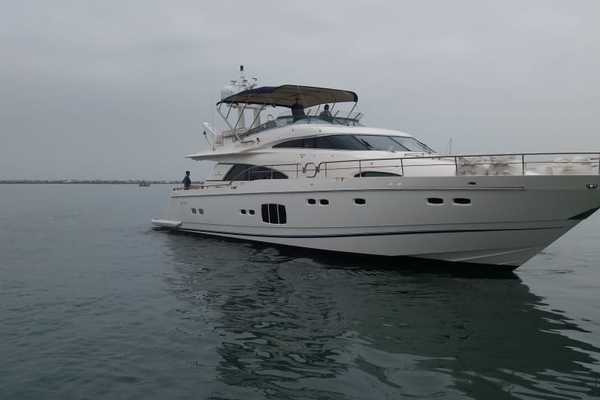 United Yacht Sales New Jersey would love to guide you through a personal showing of this 82' Latini Marine 84 2005. 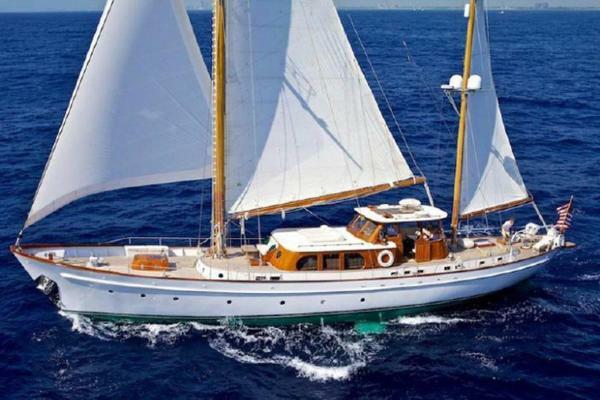 This yacht for sale is located in Call Italy and priced at $1,800,000. For a showing please contact us by filling out the form on this page and we will get back to you shortly! This 85 footer feels more like a 100 foot yacht when down below such is the feeling of space and light.8 guests in 4 staterooms with 2 additional bunks and 4 crew in 2 cabins With six cabins, five bathrooms and a crew mess this is a serious cruising and racing yacht. The current owner has younger children so wanted an interior that was light, bright and easy to clean and maintain. The owner is not a fan of teak which had the added benefit of saving a large amount of weight in the boat.SALOON:Two tables capable of seating 16 people with bench seating making for easy stowage and can be folded along its length. This modular design is something Lazzerini and Pickering first explored aboard Wally-B. Perhaps another Wallyesque feature is the fiddle that doubles as a drab rail along the continuous shelf structure.Despite the minimalist interior, Roma is rich with functional detail. For weight saving, the removable storage units are covered with water resistant leather. The overheads have leather covers and elegant hold all double as removable under bunk stowage.OTHER LIVING AREAS:Three kinds of dimerised lighting are used on board; Primary illumination is provided by fluorescent lamps behind Barrisol diffuser panels. LED provide reading and dimmable LED provide accent illumination.OWNER STATEROOM:Forward with centerline double bed with stowage under and along the deck. The owner’s suite is spacious and very light and bright. The cabin also has an en suite shower and head.GUEST STATEROOM:Three further guest cabins provide a flexible overnight accommodation with good stowage and en suite facilities. See the layout (GA) plan that follows.CREW ACCOMMODATION:Is aft with twin cabins port and starboard with light weight bunk arrangements. There is a separate crew quarters including a dining area which is accessed via the galley which can be separated from the main gust accommodation. The crew accommodation provides access to most of the yachts systems including main engine, generator and electrical/plumbing systems. Bow thruster: Max Power Water maker: Schenker 100 ltrs per hour Fuel separator:Racor fuel filtersAir-conditioning: 8 fan coil system with two compressors to all cabins and dinette Toilet system: Tecma five headsBoilers:24volt hot water heater form 220v or engine cooling for domestic hot water system.